By now, everyone is aware of the devastating swarm of large earthquakes that struck Japan this past week. The quakes generated a 13 foot/4 meter tsunami wave that all but washed away entire towns in Japan. The videos have been both mesmerizing and terrifying. The tsunami also reached Hawaii and the west coast of the United States. It caused damage to coastal sites in Hawaii, Oregon and California. For a time, Washington was under a tsunami advisory, but the effects here were minimal and no damage occurred. A warning system put in place after the 2004 Indian Ocean quake proved its worth. According to news accounts, this quake moved the Japanese coast 8 feet or 2.5 meters and the tilt of the earth changed by 4 inches/10 cm. I find it interesting that the U.S. news media always look to California and the San Andreas Fault when discussing earthquakes. It is the most famous earthquake site around here, but it is also very different from what just happened in Japan. The San Andreas is a strike-slip fault. Consider two books on a shelf. Pull one book from the shelf and you create a strike-slip between them. The land west of the San Andreas is moving north like the books sliding past each other. It is said that eventually, Los Angeles will become San Francisco's neighbor city. What happened in Japan was a "subduction zone" earthquake. To visualize this, place a book flat on a table. Place a second book at a tilt, propped up by the edge of the first book. Hold the second book in place and push the first one under it. You have created a subduction of the first book under the second. This is what happened in Japan. The Pacific Plate pushed under an arm of the North American Plate. Japan's archipelago marks the point where the two plates meet. Subduction zones produce the largest earthquakes in the world. The presence of volcanoes like Mount Fuji is a defining characteristic of subduction zones. There is a site in North America that provides a mirror image to Japan's geology. The Cascadia Subduction Zone extends from southern British Columbia to northern California. There is a rift in the sub-ocean crust where magma pushes up creating new sea floor. This upwelling pushes the Pacific plate west. At the same time, the Juan de Fuca plate is being pushed east under the North American plate. The pressure of the rising magma is unstoppable. 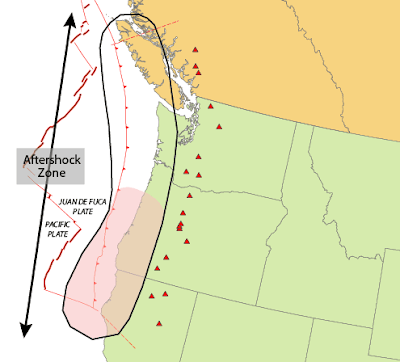 This subduction zone comes complete with a chain of volcanoes from B.C. 's Mount Meager to Lassen Peak in California and includes Washington's Mount St. Helens. If the plates become locked, pressure builds until they suddenly release. This results in a massive megathrust earthquake. A lurch of several meters together with massive underwater landslides off the continental shelf can produce tsunamis that threaten the entire Pacific basin. Ironically, the geology that brings the danger also helps create the beauty that attracts people to come here and visit or live. 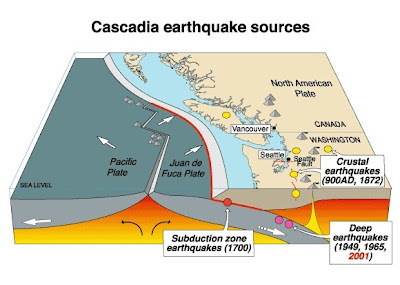 ﻿There is both geologic and historical records of Cascadia megathrust earthquakes of magnitude 9.0 or more. Using dendrochronology or tree-ring dating and Japanese writings of the period, one such quake has been pinpointed to January 26th, 1700. The earthquake caused a massive "orphan tsunami" in Japan according to documents there. The wave reached a height of 15 feet or 5 meters. Back home, the shoreline of the Pacific Northwest moved 50 to 60 feet to the west. This was followed by a tsunami wave 30 to 60 feet high washing inland. Entire forests sank causing the trees to drown and die. They still stand today giving us a way to date the earthquake. The oral history of Native Americans also provides information about the 1700 quake. This includes knowledge of places here where people should not live. Tsunami evacuation plans for the region have been shaped by the Japanese accounts of the 1700 event and the knowledge that quakes of at least M 9.0 occur here. Geologists have found evidence of 13 Cascadia megathrust quakes at intervals of between 300 and 900 years. This means we are now entering a period when another great Cascadia earthquake is due. Great post Dave - we've been thinking about how unprepared we are here on Vancouver Island and figuring that we should get around to putting together the equake kit that we've been talking about for ages. Thanks for reminding everyone. I am a transportation engineer and know all too well the planned destruction of this earthquake here in Oregon. Dave, Mike, thanks very much. I appreciate the comments.